Philips Lighting has made substantial progress towards their 2020 sustainability goal with revenues from sustainable products, systems and services in 2016 increasing to 78% of total sales from 72% a year earlier. This represents an increase to EUR 5.5 billion in sales from EUR 5.3 billion in 2015, underlining the success of the lighting company’s sustainability program ‘Brighter Lives, Better World’, which was introduced during Climate Week NYC 2016. Philips Lighting aims to deliver 80% of total revenues through sustainable products, systems and services by 2020. The company has set very ambitious targets for sustainable revenues and operations through their dedicated program 'Brighter Lives, Better World’. Key outcomes of the program include reduction in carbon footprint by 39% and injury- and illness rate by 24%; 628 million LED lamps delivered as part of a commitment to supply 2 billion LED lamps by 2020, effectively preventing the emission of 15,000 kilotonnes of CO2 into the atmosphere; and reduction in the amount of waste materials delivered to landfill by 41% compared to 2015. Thanks to their intensive sustainability drive, Philips Lighting was recognised in 2016 through Corporate Knight’s inaugural Clean 200 list, achieving 8th position in a ranking of the 200 biggest public companies based on clean energy revenues. The company also invested 80% of their R&D funds in sustainable innovation – one important outcome of this investment was the Dubai Lamp, the world’s most energy-efficient commercially available LED lamp, developed together with the Dubai Municipality. By replacing conventional lamps with the Dubai Lamp, electricity used for lighting can be reduced by up to 90%. 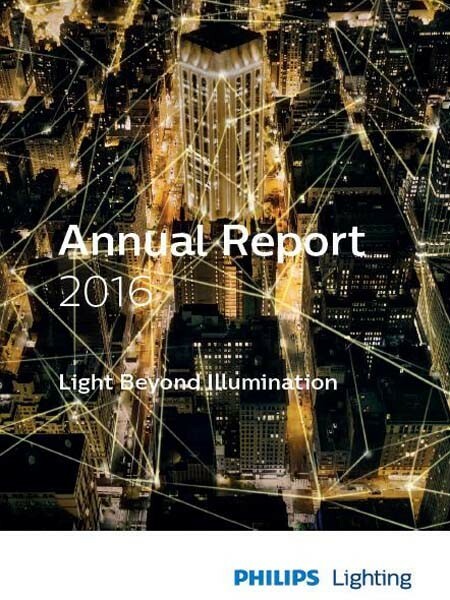 The Philips Lighting 2016 sustainability update is an integral part of the Philips Lighting 2016 Annual Report.